The Turbulent World of Middle East Soccer: Whither Saudi Crown Prince Mohammed bin Salman’s ‘moderate’ Islam? Whither Saudi Crown Prince Mohammed bin Salman’s ‘moderate’ Islam? Recent Algerian media reports detailing Saudi propagation of a quietist, apolitical yet supremacist and anti-pluralistic form of Sunni Muslim ultra-conservatism raises questions about the scope of Saudi Crown Prince Mohammed bin Salman’s commitment to what he has termed ‘moderate’ Islam. So does Saudi missionary activity in Yemen. The missionary activities suggest that Saudi Arabia continues to see ultra-conservatism as the primary ideological antidote to Iranian revolutionary zeal. Saudi Arabia has invested an estimated $100 billion over the last four decades in globally promoting ultra-conservatism in a bid to counter the Islamic republic. The campaign has contributed to greater conservatism and intolerance in Muslim communities and countries and in some cases fuelled sectarianism. Saudi support for ultra-conservatism does not by definition call into question the kingdom’s determination to fight violent radicalism and extremism, and counter non-violent political expressions of Islam. More recently, the kingdom has been willing to surrender control of major religious institutions that it funds and controls when that proves to be beneficial to improving its image, tarnished by negative perceptions of its support for ultra-conservatism. The grand mosque and Islamic centre in Brussels, Europe’s largest, is a case in point. Saudi Arabia, responding to Belgian criticism of the mosque’s ultra-conservative Saudi management, last year appointed as its imam, Tamer Abou el Saod, a 57-year polyglot Luxemburg-based, Swedish consultant with a career in the food industry. The appointment followed complaints in parliament about Saudi and other ultra-conservatives who managed the mosque. Senior Saudi officials have responded positively to a Belgian government initiative to prematurely terminate the kingdom’s 99-year lease of the mosque so that it can take control of it. Prince Mohammed has created expectations of greater social liberalism by vowing to return Saudi Arabia to an undefined form of “moderate” Islam; lifting a ban on women’s driving, a residual of Bedouin rather than Muslim tradition; granting women access to male sporting events; allowing various forms of entertainment, including cinema, theatre and music; and stripping the religious police of its right to carry out arrests. The reforms notwithstanding, Saudi Arabia has yet to indicate whether it has reduced its long-standing funding for ultra-conservative educational and cultural facilities even though Saudi financing vehicles like the World Muslim League have re-positioned themselves as promoters of tolerance and humanitarianism. The league operates the Brussels mosque. The League’s secretary general, Mohammed bin Abdul Karim Al-Issa, a former Saudi justice minister, has in the last year argued that his organization was “a global umbrella for Islamic people that promotes the principles and values of peace, forgiveness, co-existence, and humanitarian cooperation” that organizes inter-faith conferences. Algerian media reported however that the kingdom’s assertion that it promotes moderate and more tolerant strands of Islam may not be universal. “While Saudi Arabia tries to promote the image of a country that is ridding itself of its fanatics, it sends to other countries the most radical of its doctrines,” asserted independent Algerian newspaper El Watan. 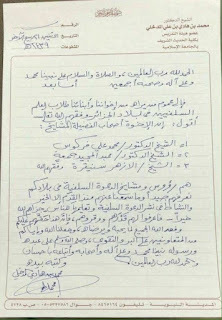 El Watan and other media reproduced a letter written by Saudi Sheikh Hadi Ben Ali Al-Madkhali, a scion of Sheikh Rabia Al-Madkhali, the intellectual father of a quietist strand of Salafism that projected the kingdom prior to Prince Mohammed’s reforms as the ideal place for those who seek a pure Islam that has not been compromised by non-Muslim cultural practices and secularism. The letter appoints three prominent Algerian scholars, including Mohamed Ali Ferkous, widely viewed as the spiritual guide of Algerian Madkhalists, as Salafism’s representatives in Algeria. Similarly, Saudi Arabia has said it would open a Salafi missionary centre in the Yemeni province of Al Mahrah on the border with Oman and the kingdom. Saudi Arabia’s ill-fated military intervention in Yemen was sparked by its conflict with Iranian-backed Houthi rebels, a Zaydi Shiite Muslim sect with roots in a region bordering the kingdom, that dates to Saudi employment of Salafism to counter the group in the 1980s. Question marks about what Prince Mohammed defines as moderate Islam are fuelled by a widespread assumption that the ruling Al Saud family cannot afford a clean break with ultra-conservatism in general and Wahhabism, its specific Saudi strand, in particular, because it derives its legitimacy from the kingdom’s religious establishment. Prince Mohammed’s grip on power by virtue of his position as heir to the throne, defense minister, and economic czar that was cemented with last year’s purge of prominent family members, businessmen and officials in what amounted to a power and asset grab may, however, persuade him that the family no longer needs religious legitimacy. Prince Mohammed’s moves have put an end to rule based on consultation within the Al Saud family and more than ever forced the ultra-conservative religious establishment to endorse his moves in a bid to survive and retain some degree of influence rather than out of conviction. In effect, Prince Mohammed has assumed the kind of power associated with one-man-rule, possibly convincing him that his legitimacy is rooted in his power and image as a reformer rather than ultra-conservatism. Like with many of his reforms, Prince Mohammed is treading on fragile ground as long as his popularity is based on expectations rather than delivery. There has so far been little in his social reforms at home or declarations about Islam that suggests that he intends to go beyond curbing the rough edges of Sunni Muslim ultra-conservatism and creating the building blocks for an autocratic monarchy capable of performing economically and technologically in a 21st century world. Prince Mohammed’s social and ideological reforms no doubt seek to fight political violence. The crown prince has yet to demonstrate that this involves in practice rather than words the countering of an ultra-conservative ideology that breeds intolerance, fosters anti-pluralism, and potentially creates breeding grounds for radicalism.